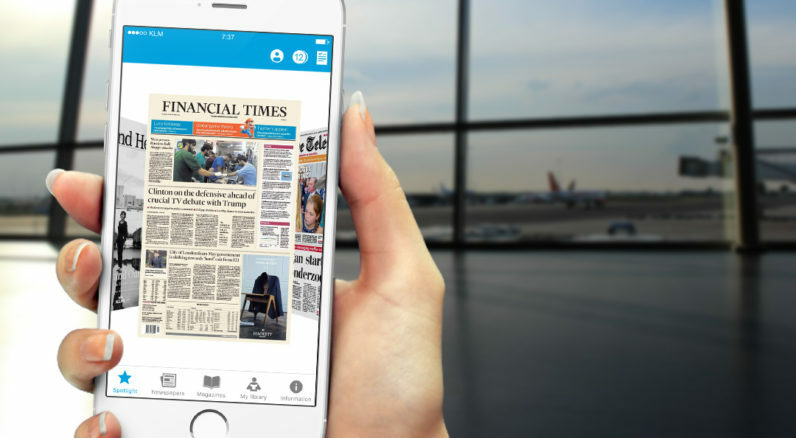 Dutch flag-carrier KLM has launched a smartphone app that allows its passengers to read a range of newspapers mid-flight for free. The KLM Media App also includes the airline’s own in-flight magazine, Holland Herald. According to KLM, more publications will be added in the future. Complimentary newspapers are a common amenity offered by full-service airlines. The move to paperless makes a lot of sense. From the customer experience perspective, it means that it will never run out of copies of a given newspaper. It will also reduce the amount of trash left behind after a flight, and thereby reduce the time needed to clean a plane. In general, an increasing number of airlines are taking a BYOD-approach to passenger entertainment. A number of carriers now allow customers to stream a range of movies and TV shows directly from their own devices. It follows that this approach would be extended to the humble complimentary newspaper.